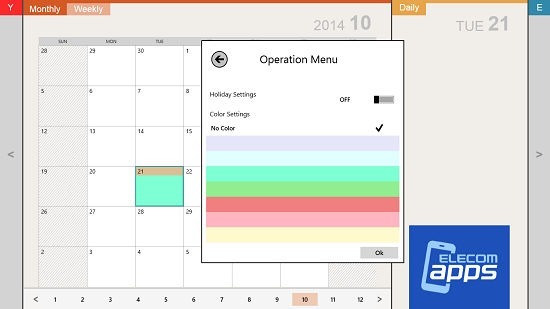 Schedule St. HD is a free app for Windows 8 and 8.1 which allows you to plan your day to day routine via adding notes in a calendar like interface. 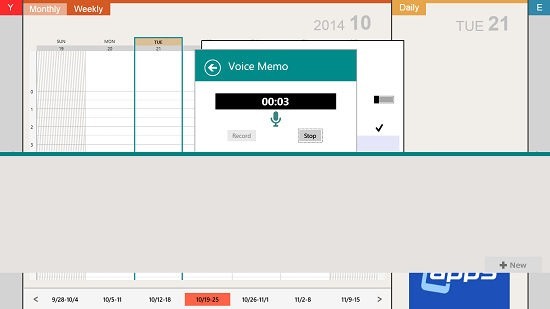 The app allows you to record text memos, voice memos etc. 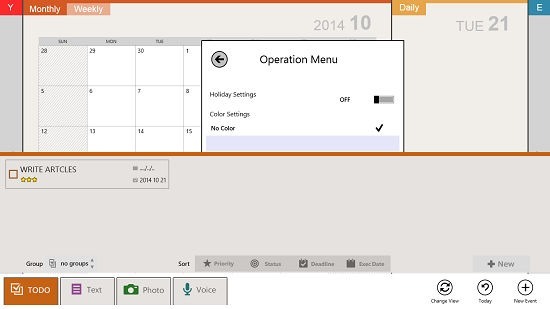 When you open the app, you will directly be presented with the calendar interface where you will be able to add To Dos etc by right clicking on the screen and accessing the option from the control bar which gets fired up at the bottom of the screen. The app is lightweight and has a nice interface which makes sure that you don’t get annoyed even when using the app for long hours (though I doubt that you will!). Schedule St. HD is available as a free download from the Windows App Store. When you open up the app, you will be presented with an interface as shown below. You can double click on a date to change its box color. When you double click on it, you will be presented with a pop up box with the options visible in the below screenshot. Simply select a color and click on the tick button to set that color. You can add an event to the date by clicking on the date, and choosing the New Event button at the bottom right of the screen. To create a To Do on that particular date, simply click on the To Do button on the control bar at the bottom of the screen, which will bring up an interface as can be seen in the screenshot below. You can see that I have already added a To Do to the date above. Simply click on the check box next to the To Do to mark it as complete. Similarly, you can add voice memos. You can do so by pressing on the Mic button which appears when you click on the Voice Memo button. 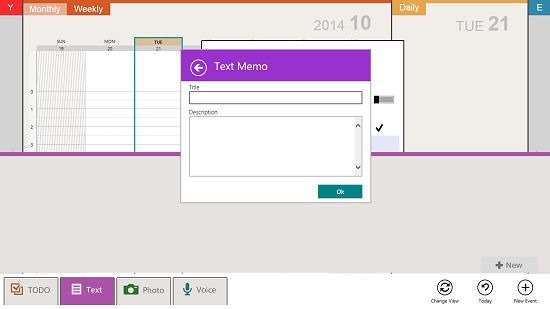 And, you can also add text memos as well. 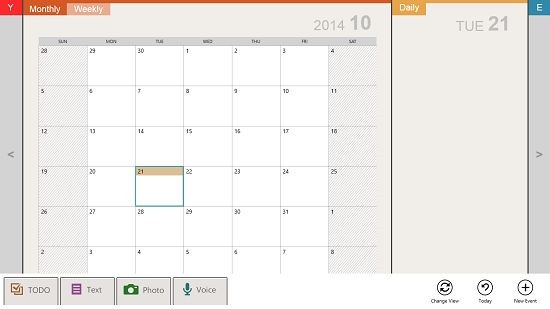 You can switch between monthly and weekly views by clicking on the tiles at the top left corresponding to the same. You can see the changed view in the below screenshot. The app’s settings can be accessed by pressing the Win+I shortcut on your keyboard. Here, you can change the calendar view settings, etc. 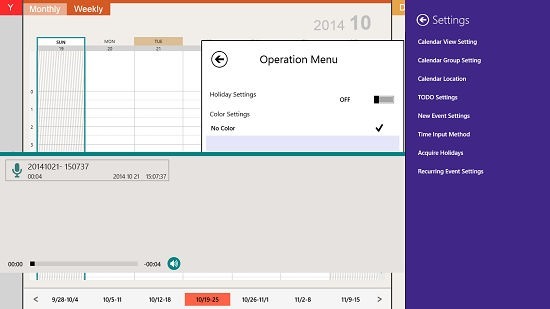 This concludes the main features of the Schedule St. HD app for Windows 8 and 8.1. Schedule St. HD is a decent planner app for Windows 8 and 8.1 with a clean interface which is so catchy that you are sure to return to this app once you start using it. Overall, this app has everything which makes it truly worthy of a 5 out of 5!